If you enjoyed my recent interview with Lucky Cloud Skincare, then you’re in luck! Today I’m talking to another Edinburgh-based small business as part of my interview series. I picked the brains of Edinburgh Yarn Festival’s founders to find out all about their business. Edinburgh Yarn Festival is the UK’s premier urban hand-knitting show. Friends Mica Koehlmos and Jo Kelly held their first successful hand-knitting event in 2012, and this soon developed into the Edinburgh Yarn Festival. Mica and Jo are currently organising the 5th Edinburgh Yarn Festival, which will be held in March 2018. The festival includes a market place with around 100 hand-picked vendors, hands-on workshops and classes, as well as plenty of opportunities to meet up with other knitters. We LOVE knitting and we are passionate about our subject! When we organised a surprisingly very successful first hand-knitting event in 2012 in Edinburgh, we realised that we had created something that people really wanted. Fast forward a few years and we still love it! Having created an event that is internationally recognised as one of the best in our industry and that has become an annual bucket-list destination for knitters from all over the world. All those ideas! We are constantly trying to improve everything we do to stay on top of our game. What was the best business decision you ever made? Go big (and don’t go home). Not starting a business earlier! What’s the best piece of advice you ever got? “Name your price and walk away”. Pricing products and services is something a lot of new businesses struggle with, but if you arrive at a price point after careful calculation that feels right for you (and that enables you to develop and continue what you do) then that is the number that’s right. Don’t justify it – quality speaks for itself. How do you attract new clients or customers? We mostly use social media, but we also sponsor selective high quality publications and products in our own niche. We like to be more involved than simply pay for print advertising and hope for the best. Apart from that we spend a lot of time building and maintaining relationships in our industry. We visit a lot of events and businesses throughout the year and never stop talking about our event. We have become the event, and every day in the year we promote it with every interaction. What do you enjoy most about your marketing? Photography! We love what we do and even though it’s hard work coming up with quality content, creating images is fun! We both love Instagram and post every single day of the year to keep the EYF magic alive. A knitting project on the go and cup of tea (or gin!) with Netflix. Oh, that’s a difficult one! 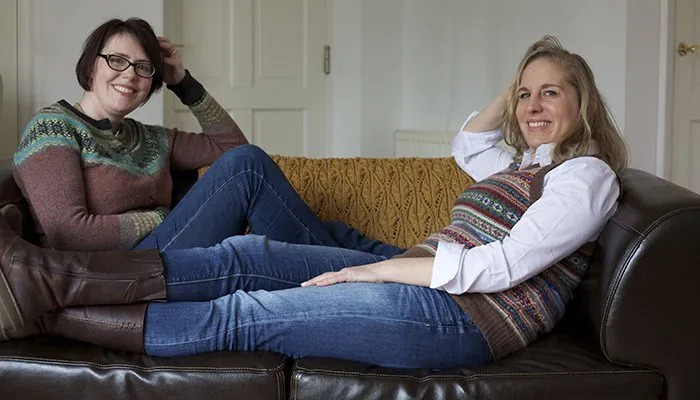 There are so many talented people in the hand-knitting and yarn industry alone, but we hugely admire the global brand Brooklyn Tweed has created. In particular we love the styling and mood in their contemporary photography, showing off their beautiful designs and yarns. Looking at their pattern publications we actually want to be transported into the shooting locations of every single look book they publish. We want to be that person in the photograph, wearing the garment – that’s what a great brand should do to you. As a result of their brilliant marketing Brooklyn Tweed has hugely contributed to killing the myth that knitting is for grannies! What’s something you dream of doing? We are already very fortunate in terms of what we do, but we would love to explore the Faroe Islands with their ancient breed of sheep and beautiful knitting traditions. We are writing a travel guide for Scotland, aimed at knitters! We get so many questions and request for travel tips to textile attractions that we decided to write a book about it. We’ve spent all summer travelling to woolly dream destinations and are working on this project alongside the extensive event preparations for EYF 2018. We aim to publish it in 2018. Find out more about Edinburgh Yarn Festival on their website, edinyarnfest.com. You can also follow them on Instagram, Twitter and Facebook. Next Article Next Article: Why You Should Work on Your Small Business, Not Just in it.